PERRY, Fl. – Popular Florida-based Southern-Gospel family group, The Walkers announced their upcoming participation in the SSE Promotions “Night of Giving Concert” which is part of their 2019 Stomp Out Hunger campaign. 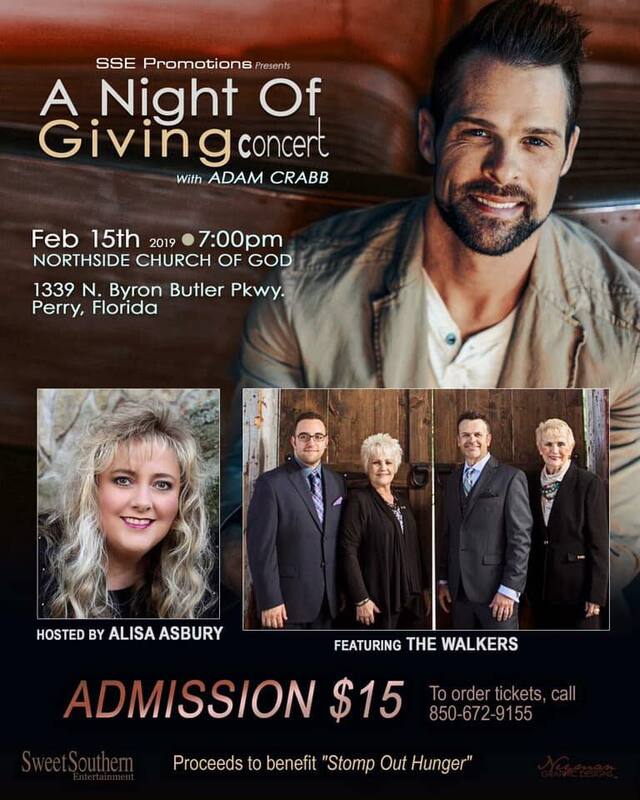 The event will feature Adam Crabb, member of the Gaither Vocal Band. He is also known as the “face of youth” for one of Southern Gospel’s first families of music, The Crabb Family. This important event is being held on February 15th, 7 pm, in the Walker’s home town of Perry Florida. The concert will be at Northside Church of God, 1339 N Byron Butler Parkway. Proceeds from the event will be used to feed families in and around Taylor County. Tickets are on sale now for $15, and are available by calling Billy Walker at 850-672-9155, David Johnson at 863-409-2356 or Linda Randall at 850-295-1965. Tickets will also be available at the door.